As you can see by the sliding door system, this plan optimizes the use of windows to capture the view. That feature coupled with the wonderful deep porches makes this quite the perfect home… and if that isn’t enough, if this plan is a bit too large for your needs, they have created another plan that is a bit smaller and it’s fabulous! 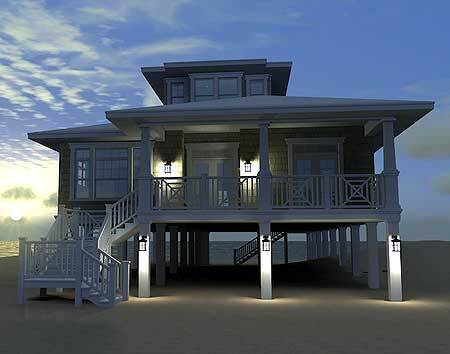 Plan W44116TD: Low Country Beach House (1,581 square feet) – personally, I would go for this one! Video Tour: Fly around this house plan in a 32 second You Tube video. What a novel concept! My post from a year ago… Featured Artist… Jane Chapin! My post from two years ago… Quick and easy macaroni salad, perfect for a warm summer day!